CAD4U has many loyal users including those who have progressed from RoboCAD and CAD4U for DOS … without having to abandon their considerable investment in time and money just to make the move to a Windows operating system. CAD4U offers greatly enhanced functionality within an instantly recognisable environment with the added advantage of being able to access all existing drawings. We take great pride in our history of providing CAD4U as the affordable Computer Aided Design system of choice to a wide user base with a great diversity of applications, from individual business professionals through to blue chip companies, local authorities and government bodies. CAD4U offers a host of features to take advantage of the Windows operating system, giving users total desktop integration of drawings into all your favourite Windows® applications. CAD4U has long been recognised as one of the most intuitive and functional Computer Aided Design products available, so if you are thinking of upgrading from RoboCAD®, original CAD4U for DOS, or looking for new CAD software with superior performance, then CAD4U is the answer. 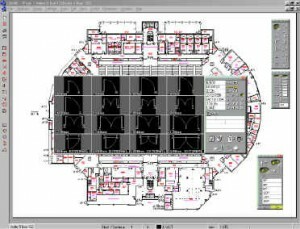 Unique graphical drawing Library for fast access, inserting and positioning of components, sub-assemblies, modules & symbols. CAD4U software is available in two levels of functionality – CAD4U and the ‘lite’ version … CAD4U-XS. Below is a guide to the major functionality differences between the two products … it is NOT a FULL feature list. – Windows 10, 8.x, 7 (32 & 64 bit). – Drawing, editing, annotation, associative dimensioning, hatch and colour fill functionality. – Unique fully integrated graphical ‘Library’ filing system. – Integrated import and export of ubiquitous DXF, DWG, HPGL & PDF formats. – 20 day full evaluation. – After which an unlimited license requires Activation. – Available for 5 CAD4U workstations or more. – Requires customer specific CAD4U Network Login Module. – Vector plotting using legacy PLT plotter drivers for HPGL & HPGL2 plotting & file creation. C-TECHNIK Software GmbH reserve the right to change or amend specifications without prior notice. All trademarks acknowledged.